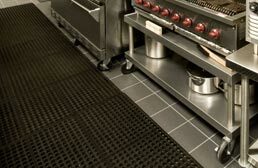 A RubberFlooringInc we offer a wide range of kitchen mats great for commercial and residential kitchens. After a long day of slaving over the stove, the last thing anyone wants is a major cramp running up and down their leg. 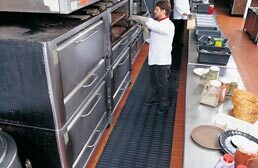 Our commercial kitchen mats are made of NBR and Nitrile rubber. Rubber when wet is very slip resistant and is able to withstand the oils and greases that are found in commercial kitchens. 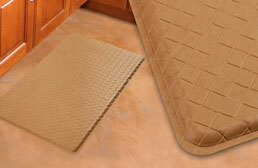 Our residential mats are made of rubber, foam, and gel and provide excellent comfort underfoot. All of our home kitchen mats are very durable and help to alleviate the stresses caused by standing for long periods of time. It’s Thanksgiving eve and you have your whole family coming over for dinner. Turkey, stuffing, dinner rolls, candied yams, mashed potatoes, pies and cakes are on order. This is going to take hours and your feet already hurt from standing on your new porcelain tile that you spent thousands on - it looks like a million bucks, but at this moment it is like a bed of knives to your feet. What do you do? Who is gonna save your feet? Superman? Batman? No, who you need to call is RubberFlooringInc to get a quality kitchen mat! As you can see, kitchen mats are made to provide comfort when you have to be on your feet for long periods of time in the kitchen. Whether at your home or in the five star restaurant downtown, a quality kitchen mat is a lifesaver to chefs around the world. 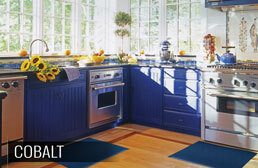 Kitchen mats come in all shapes and sizes for both commercial and residential kitchens. 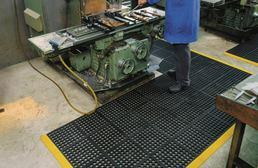 Commercial mats are typically porous and feature nitrile rubber (this is a special type of rubber that is resistant to the oils that are found in commercial kitchens). 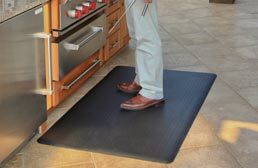 These mats are also very slip resistant, which is a must when you are running around a busy kitchen with the biggest, sharpest butcher knife in the restaurant. Yikes! Residential kitchen mats are more designer looking and solid in construction. They are geared more towards comfort, but are still resistant to slips,oils and household chemicals. They are typically smaller than commercial mats, but do come in several sizes to best suite your matting needs. 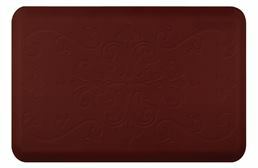 Commercial kitchens are the most common place that you will see any sort of kitchen mat. The main reason is that chefs spend a lot of time on their feet. For them, not only are their hands essential, but their feet are just as important for them to do what they do: make delicious food! 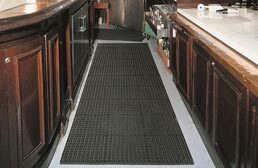 Because of this, kitchen mats are essential to making any bar or restaurant run. 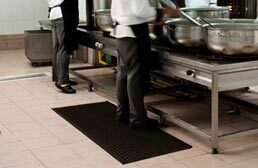 Not only do these mats help provide relief for the chef’s feet, but they also provide a slip resistant flooring surface for them to walk on. This is essential, and is actually required by law for most restaurants to be in business. 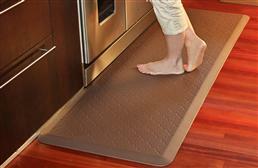 This style of kitchen mats typically come in two only colors: black or red and come in several different sizes. What do the two colors mean? So why only two colors typically? Well that is because the two colors represent two different types of rubber that is used. Black mats are made from natural rubber which, typically, is just grease resistant, whereas red mats are made from nitrile rubber which is grease proof. Grease is a huge issue in commercial kitchens because it is typically everywhere and can damage the mats. Installing our commercial kitchen mats is very simple. Some of our mats can be connected to other mats to create larger mats, while others are just straight cut mats. An example of an interlocking mat is our Cushion Tred mat. 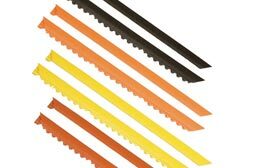 An example of a straight cut mat is our Safety Step. All of our mats are very easy to clean with a hose and a mild soap and water solution. When you think of home kitchen mats, most people think of the cheap, thin rugs that feature some cute saying like ‘welcome to our home’ or ‘chef at work’ with a nice picture. While those kitchen rugs are nice, they aren’t the type of kitchen mats that will provide you the relief you desire. 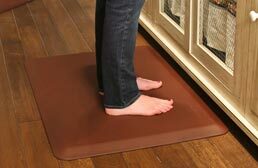 Our kitchen mats are thick and cushiony kitchen anti-fatigue mats that will give your feet and legs a break while slaving over that stove or sink. 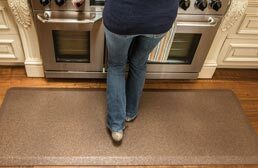 Most home kitchen mats will feature either a foam or gel filling and are encased in a rubber outer shell to help with slip and stain resistance. 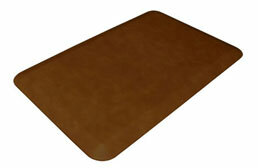 Foam mats are the most commonly sold anti-fatigue kitchen mats. They are typically cheaper and are very easy to make because foam is readily available. Think about it, foam is everywhere in our lives. Foam is in your car seats, in your couch, and in your pillows. You would think that we lived in one large foam party! 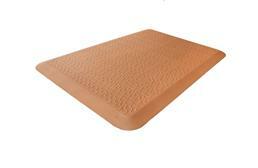 These mats provide excellent anti-fatigue properties and offer outstanding comfort and relief. 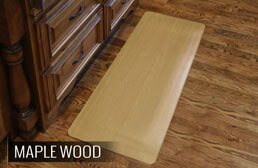 Our foam mats help stimulate circulation while absorbing the stresses of standing. 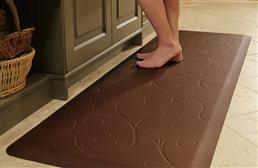 Gel mats are a newer form of anti-fatigue kitchen mats and have really become popular lately. Gel mats are great if you are planning to stand for long periods of time because the gel conforms to your feet for proper support and relief. 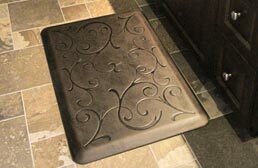 These mats are still firm and are great to use in kitchens that have harder surfaces like stone and tile.